We started with eight (Ken & Anne, Mike B, PB Lorna, Kay G, Peggy K, Terry C and me) and picked up newbie Mary “bugam” Bragg at Terry Nova Park in Richmond. 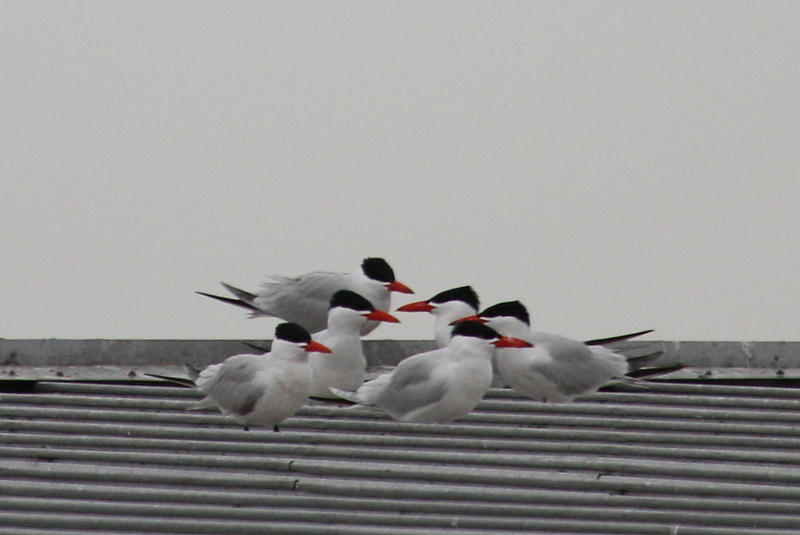 It was raining while we visited the Caspian Tern Colony, but cleared and warmed up nicely for our walk in TN Park. Hi-lites other than the Terns were a “fallout” of Warblers, many ambitious Marsh Wrens and irridescent Rufous Hummingbirds, and Lorna’s PB and Banana Sandwiches. 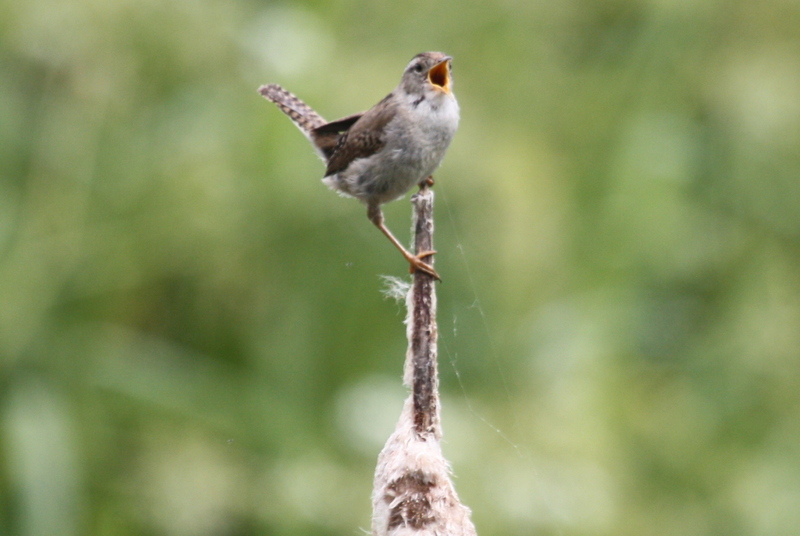 Check out Terry’s & Ken’s photos already posted on our Picasa site at http://picasaweb.google.com/dncbirding (Bugam’s to come soon). We left Petra’s shortly after 7:30 a.m. and got to the River Rock Casino in excellent time, via the HOV lane to the tunnel. 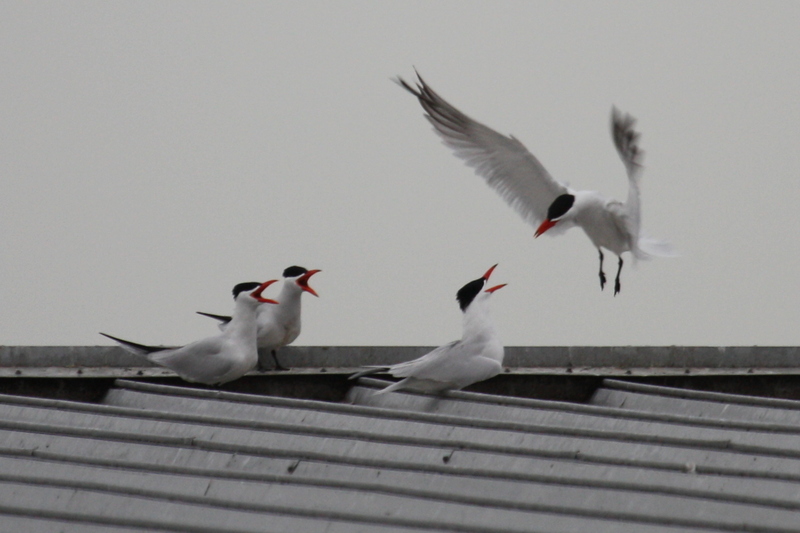 A “Bike to Work Day” tent was at the walkway entrance onto the bridge to the good viewing point for the Caspian Tern colony hanging around/nesting on the metal warehouse roof. 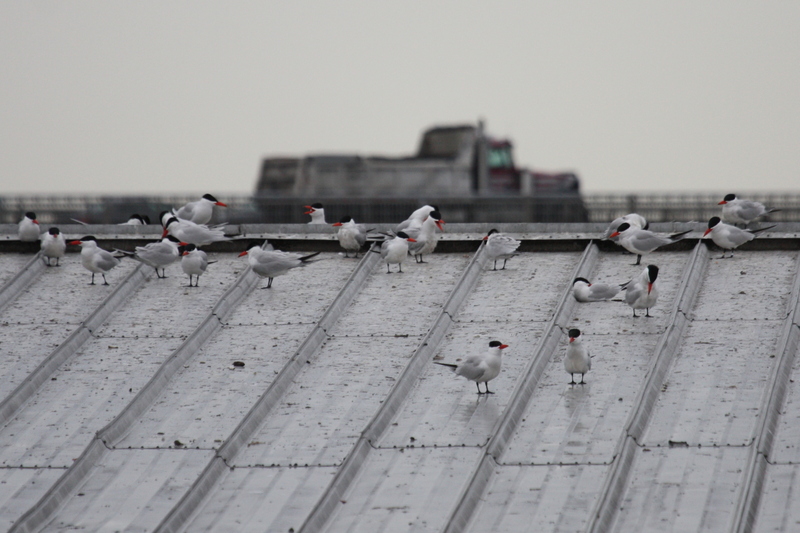 There were lots there; I counted 98 on one roof side with many others flying and on the other non-visible roof side. One was sitting, perhaps on an egg; others were bringing fish to mates? At least one had two leg bands. Glaucous-winged Gulls were also there with two sitting on nests. Lots of Swallows swooping around, too, mostly Violet-green, a few Barn and probably other species. A Killdeer in the mud and an American Goldfinch in the reeds were grazing along the Fraser’s shore below us. Following a chat with the Bike Day folk, we drove to Terra Nova Park, past the beautiful homes along River Road and “Kay’s Pheasant Fight” spot near the entrance (another story from an earlier outing). Following Pee Break, we wandered the dike path a bit. 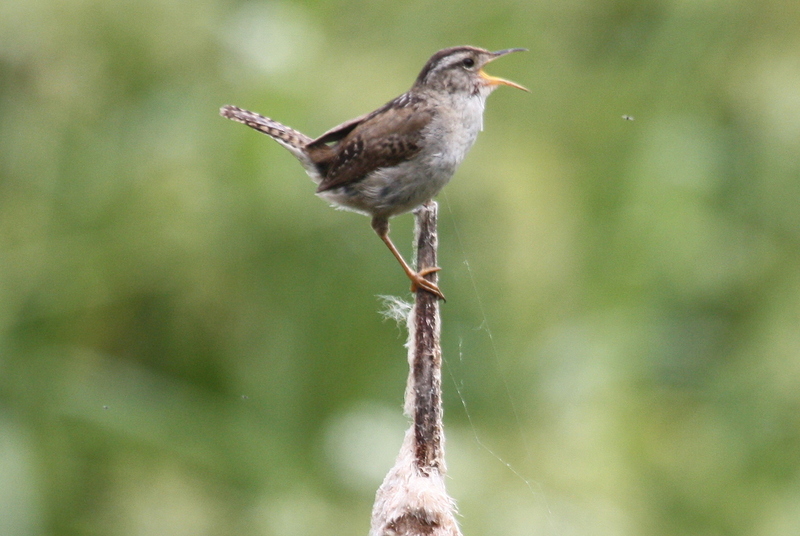 Marsh Wrens everywhere, singing and building their numerous nests. One Bald Eagle on the shore near a flock of Canada Geese. No Shorebirds seen where we often see many. We entered one of the paths into the newly-renovated Terra Nova Park and the trees were alive with Warblers, unfortunately at the tree tops and flitting quickly behind leaves and branches making it difficult (and frustrating) to identify. We got decent looks at a Yellow Warbler and, of course, Common Yellowthroats were singing all around us. A flock of Cedar Waxwings and a couple of beautiful posing Rufous Hummingbirds eased our Warbler frustration. We smiled when Mike B posed on a hilltop next to a dancing Buddha. We walked the circuitous paths to the Richmond Garden plots and we met Bugams who took our mandatory Group Photo. Tent Caterpillar nests were common sightings and Terry got a good shot of a “live one”. The occasional Flycatcher gave us brief appearances; hopefully someone can ID the species (Willow?) from the photos on our Picasa site. Only Gadwalls and Mallards were seen in the ponds from the boardwalk. Our warbler identification frustration continued as Bushtits, Finches and Chickadees flitted confusingly among them in the trees. My respite and saving Grace was back at the vehicles when Lorna brought out her PB sandwich, with bananas. I washed these down with world-traveler Terry’s stale nut mixture. Another fun and almost-exhilarating Casual Birding morning. High Society at the Stanley Theatre last night was very enjoyable too, making for another nice “Sunday” (Every day is a Sunday for us retired folk). This Sunday, June 3, Delta Nats will have its “hands-on” Display at Delview Park in North Delta for Environment Week celebrations. Volunteers welcome to join us from 12:00 p.m. to 2:30 p.m. (wo)manning our booth (Call me if interested). 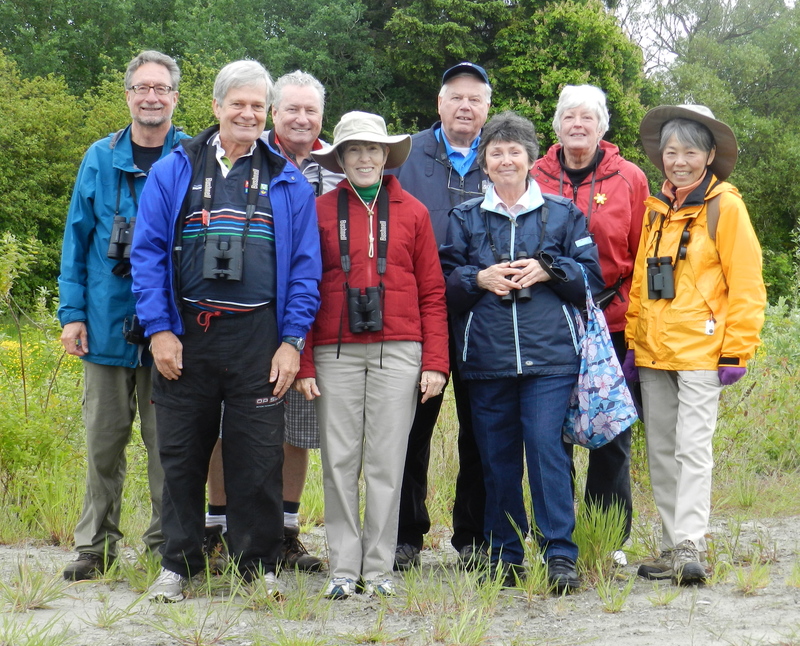 Next Wednesday, June 6 is our quarterly Birds on the Bay outing at Boundary Bay Regional Park. We meet and leave on our Walk from historic Cammidge house at 9:00 a.m., and then, on return to CH around 11:30 a.m., we enjoy goodies prepared by our Delta Nats Ladies. As always, comments welcome, check out our Blog at www.dncb.wordpress.com, and tell me if you want off this undistinguished list of recipients. Cheers. This entry was posted in *DNCB, Terra Nova. Bookmark the permalink. Hope to join you people some day.